Rising London-based producer Otik steps up with his debut 12” for Bristol imprint Durkle Disco. Resolutely rooted in the present day, both tracks gleefully nod to the past by channeling the darker end of UK garage, Detroit’s industrial moodiness and the dusty depths of early dubstep. 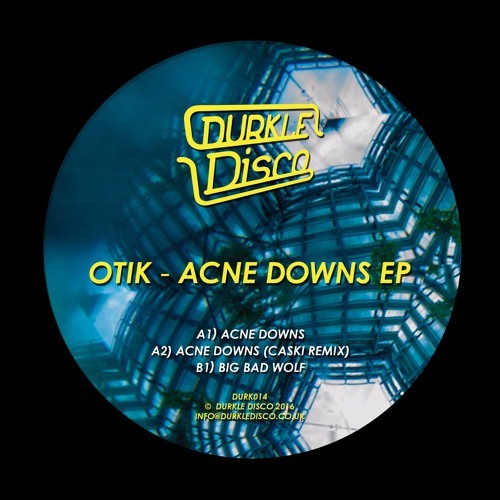 Remix duties for ‘Acne Downs’ go to Caski (Ghost Recordings/EMF/Keysound), one of the leading proponents of the slowed down 2-step sound, whose reworking aims straight for the dancefloor. Otik has been steadily building a reputation for forward thinking, genre-bending sounds around the 130bpm mark. In addition to his regular Radar Radio show, recent releases have graced Dusky‘s 17 Steps imprint, Infinite Machine, and Push & Run – with support from BBC Radio 1Xtra and BBC 6 Music. All this makes Otik a welcome addition to the Durkle Disco ranks; joining previously released artists including Lamont (Swamp81), OH91 (Coyote), Lemzly Dale (Sector 7), and Superisk (Punch Drunk) on a label that’s forged a reputation for pushing exciting new producers across a range of genres and tempos.